The Cup is over and the countdown to Christmas and the festive season is on! Santa's helpers are getting busy sourcing gifts for family and friends, and we have some great gift ideas for wine and food lovers to lend them a hand. From good books – one of the joys of summer holidays is time to relax and read – to wine, there's plenty to please any wine or food lover, including you. There's lots happening around Australia's fabulous wine and food regions too, with events in almost every region (see below). This photo of Cup weekend's Toast to the Coast was sent to us by the Geelong Winegrowers' Association, who had a fantastic turnout, including 5 lucky VisitVineyards.com subscribers and partners, courtesy of V/line. One of them contacted us to say “We had a great time, bought some good wine and plan to visit each of the areas... over 3 separate weekends. So the festival did its job it made us aware of wineries and areas in the Geelong district that we were not aware of in particular the beautiful Moorabool Valley”. Check out our wine and food news and reviews too, plus fabulous giveaways including 2 or 3 nights in Queensland's home of wine, the Granite Belt, or one of 4 half-dozens of their Strange Bird Wines. And find out who won the 3 or 4 night stay at Bonking Frog Wines in WA's Geographe region!! If you've always wanted to become a vigneron but don't have the space or finances, Adopt-a-Vine gives you or your loved one the chance to join the wine family, and to see the vine to wine process first hand. Certainly a unique gift for a wine lover – grow your own! Wine and food – it's certainly the time of year to be thinking about both. And congratulations to Tasmanian whisky maker Bill Lark for his appointment as 'tourism champion' by the Tasmanian Minister for Tourism, Scott Bacon. If your mind is drifting to holidays – whether short wine and food breaks or longer, luxurious stays – we're here to inspire you. The first is a favourite: Australia's ultimate winery experiences, plus the equivalent in our top-of-the-range accommodation experiences. We also have an unexpectedly good short stay, and a fun look at a European country that may, or may not, exist! (This is a gorgeous book and would also make a great gift for a discerning traveller or lover of Australia). All these fantastic prizes will be drawn in early December, just in time for the festive and holiday season. What a sensational mix we have: accommodation on the Granite Belt, StrangeBird wines (for those who love alternative wines! ), a unique wine tasting tour, beautiful Barossa shiraz... the list goes on! Wishing you good luck with all these competitions! Winners, Kerry's back on deck and wondering where you are? There are great prizes still to be claimed so don't miss out! Is your name on our winners' list? Then get in touch!! If you're an Auto Club Member*, consider planning your wine country travels in Victoria, Tasmania and Queensland around these recommendations - you're sure to find a welcoming smile and saving or too as well! * discounts apply to all RACV, RACT, RACQ, RAA, RAWA or NRMA members and policy holders, and all AAA members visiting from overseas. 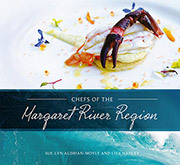 How appropriate for this time of year – we're talking bubbles and fabulous food from the magical Margaret River! Australia's wine industry needs you! As mentioned in our last newsletter, VisitVineyards.com ran a survey of the Australian wine industry in October – and received a substantial 271 reponses in just 12 days, from almost every wine region in Australia! Yes, there are some issues in the industry, but there are also a lot of positive things happening, including of course the overall quality of our fabulous Australian wines. If you're interested to read VisitVineyards' survey summary, the WFA have published it on their website, here. (You can also read other submissions, including from the major supermarkets, regional groups and more). It highlights some issues that should concern us all – and give us all the more reason to get out into the country, buy Australian wines, and support our winegrowers, makers and farmers direct at the source! We're having some fabulous wines sent here lately – look out for an email with our specially selected wines coming very soon! Cheers from Robyn, Kerry, Andrew, Charlie and the VV team. Winemakers, if you want to sell your wines to our subscribers, please email Charlie today and he'll send you more info. Take a 2 hour private tour and tasting at the iconic Cape Mentelle in Margaret River and enjoy a substantial saving. Enjoy a bonus long weekend at Denmar Estate in NSW's Hunter Valley.